Back-to-Back! MeetingOne Named 2018 Adobe Connect Partner of the Year. MeetingOne has done it again! Adobe Connect remains one of the preeminent web conferencing platforms on the market, and by far the best for eLearning. The solution is ideal for online training and webinar use cases, and countless users also enlist the tool for their online day-to-day or high touch meetings. A huge part of Adobe Connect’s success can be attributed to their extensive Partner Ecosystem. Dozens of companies have come together to resell and enhance the Adobe Connect solution. Every year, Adobe Connect recognizes the Partner who most embodied their commitment to excellence. And so, it comes as no surprise that MeetingOne was named 2018 Adobe Connect Partner of the Year! It was the 2nd year in a row MeetingOne received the award, and the third time in only the past 4 years! We couldn’t be happier about Adobe Connect’s recognition, but we couldn’t have done it without the hard work and dedication of our teams – and above all, our customers. 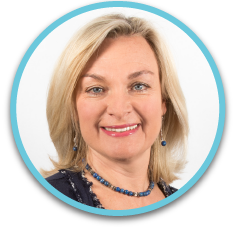 Continue reading to learn what MeetingOne’s CEO, Sophie Lal, has to say about the special year that was 2018. After receiving Adobe Connect Partner of the Year for the second year in a row – and for the third time in the last four years – I am absolutely thrilled. My pride in the MeetingOne teams could not be bigger as through 2018 I saw them meet each new challenges head on and strive to gain and strengthen the trust of our customers. This year, we grew as both a company and a team. In this blog, we’d like to take the time to reflect on the challenges we faced and obstacles we overcame in 2018, a feat this team took on with a unified mission: To bring our customers trusted technology and solutions that help them achieve their big ideas! In essence, I believe that is what being Adobe Connect’s Partner of the Year is all about: Understanding how to come together to use our passion to achieve something incredible. Our success is a mirror to our customers’ success, and it brings us such pride to be recognized and know we’re on the right track. Beyond the Partner of the Year award, 2018 was a special year. 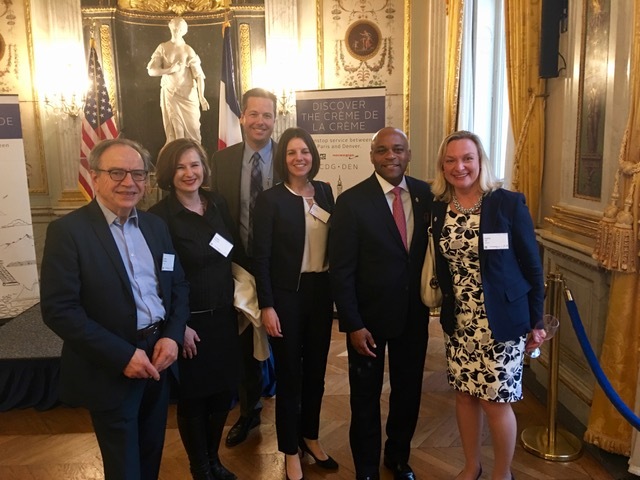 Having a thriving international office in France, MeetingOne was invited to participate in the growing overseas business relationship between France and Denver, Colorado. As CEO of MeetingOne, I had the honor to be a part of an exclusive delegation on the inaugural direct Denver-Paris flight in April, 2018. While in Paris, we enjoyed tours of Boulder-based TechStars’ Paris office; the location of the Marshall Plan negotiations, which led to the rebuilding of Europe after WWII; and the highly exclusive Christian Dior museum. While expanding international relations, my team was hard at work planning our first big local event for our USA customers. In October of last year, we sponsored and produced the first Colorado Adobe Connect Lunch & Learn. 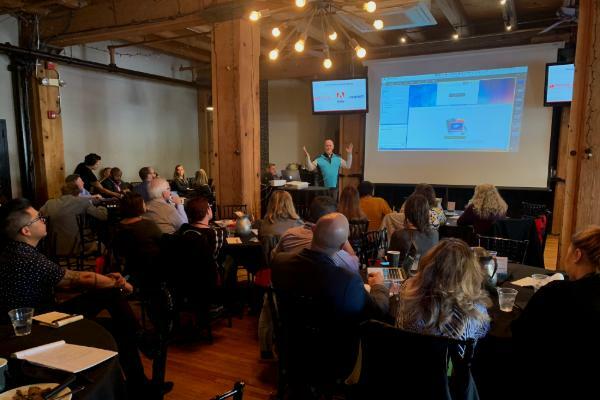 Our attending customers enjoyed food and drink in the fun atmosphere of Wynkoop Brewery while experiencing an afternoon packed with Adobe Connect tips and tricks from Adobe Connect’s leading product expert, Peter Ryce. He also provided a demo of the new HTML5 Adobe Connect client. As a special treat, our guest speaker from Intuit modeled how their internal training programs leverage Adobe Connect, MeetingOne’s integated audio conferencing, and webinar production services, to achieve an improved learning experience for helping new managers become the next generation of Intuit leaders. The event was greatly enjoyed by all in attendance! I also want to mention our participation in the annual Adobe Digital Government Technology Conference in Washington DC on November 7th, 2018. Partnering with another Adobe Connect Reseller, CoSo Cloud, we had the tremendous opportunity to present the Adobe Connect solution to nearly 600 government employees in-person and online. The event offered attendees 16 breakout sessions on leading tech trends and how they impact government agencies and institutions. Understanding government needs quite well, we spoke to the security Adobe Connect and MeetingOne’s audio offer, making them an ideal pairing for agencies with the high-consequence collaboration needs. The conversations we had were well-received and informative to all! MeetingOne is proud to partner with a great organization like Adobe. Our ongoing collaboration with their talented teams – whether on the tech, support, marketing, or joint vision sides – has taught us that working together and being the voice of our customers continues to deliver the best industry solutions. We can’t wait to see how far we can go, and we look forward to working with Adobe every step of the way. 2018 was another amazing year for MeetingOne. To be named the 2018 Adobe Connect Partner of the Year, well that’s now just what we expect to achieve. As the CEO of MeetingOne, I am proud of my teams and their tireless efforts to continue innovating our products, services, and support for our customers. We’ve continued expanding our solution-based approaches to help clients get the products and services they need, but don’t think we’re done! Here’s to our customers! Onward and upward in 2019! Why we are 2018 Adobe Connect Partner of the Year! A strong company depends upon how much time and resources are invested in the team. At MeetingOne, we’ve continued growing our teams with each passing year. And in 2018, we doubled down on the investment by sending more personnel to educational conferences, providing additional skill-building and training resources, and facilitating more in-office learning sessions. We believe that by improving our employees’ skills, we will deliver the best possible conferencing solutions and services to our customers. We’re confident that enhancing their expertise will push our products and support to even greater levels. Having the right support is critical to the success of our customers. For the last several years, we developed new programs and services to pair with our existing support offerings. Each was proactively intended to help customers seamlessly onboard our conferencing solutions and continue to use the tools we provide them more efficiently. After seeing these services in action, our executives made critical refinements to all our offerings. Each and every tweak was made in response to customer feedback. Often, customers were brought in to discuss the ways our programs could be improved. There’s no doubt that our efforts are paying off. Customers get better service every day, and our teams are working more efficiently and effectively to serve them. Along with our great Service programs and offerings, we’ve continued to diversify MeetingOne integrations. These integrations make it possible for our customers to remain agile and use Adobe Connect and AudioOne across departments and 3rd party applications effectively. MeetingOne has long provided customers the convenience of managing their Adobe Connect rooms from Outlook. 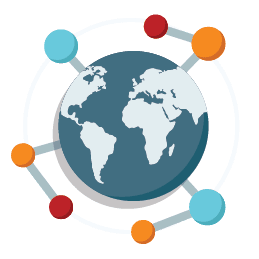 Our integration is one of the most feature rich SSO solutions on the market. Still, we’re never satisfied with improving our products. With fresh eyes, we re-approached our Outlook Integration and enhanced functionality. The improved integration is faster and can be used more efficiently than ever before. Many of our integrations, like MeetingOne’s Outlook Integration, remain ideal enhancements to Adobe Connect. In fact, our audio integration is even preferred by the Adobe team – we are proud to say they use it in-house themselves! A great example of our efforts to provide our customers the best experience was our Adobe Connect Lunch & Learn we held in October. 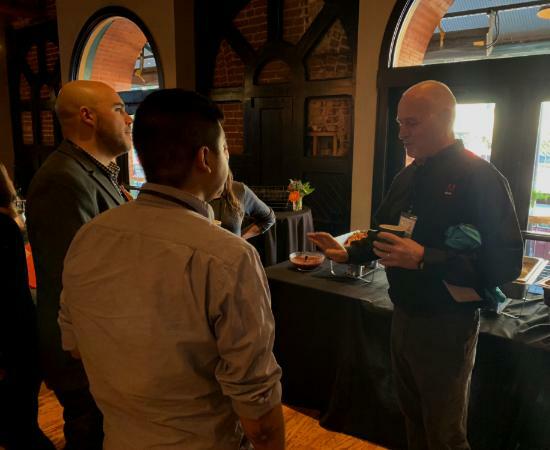 Hosted at the Wynkoop Brewery in Denver, Colorado, we invited nearby customers an unparalleled opportunity to explore Adobe Connect with their leading product expert, Peter Ryce. Peter provided attendees new tips & tricks for the platform before he went on to demo the HTML5 version of Adobe Connect. Attendees also heard from Intuit’s Staff Learning Architect as she discussed the ways they use Adobe Connect and MeetingOne’s solution for training and development. No one argued with the free lunch and drinks, and the winners of a few prizes were greatly pleased! Everyone walked away with new ideas for getting the most out of Adobe Connect. MeetingOne, alongside partner CoSo Cloud, educated the over 600 in-person and online attendees at the Adobe Digital Government Technology Conference on the Adobe Connect solution. While the Conference was rich with learning opportunities, including 16 breakout sessions between 4 tracks, it offered the government employees in attendance access to leading experts within the government and other industries. Complementing the learning tracks, the MeetingOne team discussed and educated many attendees on various Adobe Connect solutions. The information was vital, as few conferencing providers can meet the rigors of governmental procurement, security, and compliance needs. We spoke to the strengths of both Adobe Connect and MeetingOne security architectures, while providing ideas and insights for facilitating the most productive sessions, whether online or over the phone. By the day’s end, a number of the United State’s government employees were made illuminated to the importance of the right conferencing solution. While much of our attention is paid to Adobe Connect, MeetingOne has a proprietary audio conferencing platform of its own. Developed to help businesses with unique use cases, like call confidentiality and control, MeetingOne audio conferencing is versatile enough to serve any business. In 2018, we invested heavily in improving MeetingOne’s call management interface: Click&Meet. The new and improved Click&Meet 5 is as sleek as it is dynamic. The ability to facilitate productive conference calls has never been easier! See this new interface in action first hand, start a trial! Growing Our Customer Resources – Visit our content library! Ensuring our customers are reaching their goals is focal to our efforts. So, we’ve been developing great resources and content for the last five years to help educate them. In the last 12 months, we’ve created new eBooks and dozens of blogs to help customers make the best use of their conferencing tools. Our webinar program remains the best in the Adobe Connect reseller ecosystem, as well! 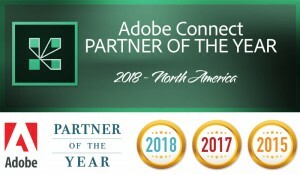 Can the 2018 Adobe Connect Partner of the Year repeat? We intend to! With so much improvement made in 2018, you may wonder what we could possible do to top ourselves in 2019. We’ve learned that the key to our success is understanding what best helps our customers. We want to help you reach your goals and bring your big ideas to life! In 2019, we intend to keep improving our outreach with our customers. We’ll seek their insights and opinions more often, then take their suggestions to the drawing room to see how we can continue to make enhancements to our conferencing solutions. Customer centrism: It’s our only philosophy. It’s our passion. Learn more about MeetingOne’s vision and mission! Sophie grew up in Paris, France. In 1995, Sophie moved to Denver, Colorado. With the help of co-founders and key investors, Sophie helped launch MeetingOne in 1999, in downtown Denver. Sophie takes pride in seeing MeetingOne prosper by empowering customers and their different use cases all over the world with the best audio and web conferencing technology supported by personalized customer service. Always striving to achieve a better user experience, Sophie has established a model of pursuing excellence that has ensured MeetingOne will continue have success well into the future.